This entry was posted in Pixel Scroll and tagged Adam Roberts, Apex Magazine, Blade Runner 2049, Camestros Felapton, Galactic Journey, Glen Weldon, Jason Sizemore, John Hodgman, Kit Reed, Kitschies, Nerd & Tie, Nick Izumi, Nisi Shawl, Star Trek: Discovery, The Carl Brandon Society, The Orville, The Prisoner, Timothy the Talking Cat, Todd Mason, Wonder Woman by Mike Glyer. Bookmark the permalink. *OK symbol over eye* Be scrolling you! @15: Apparently Morgann is insisting on a new story? Perhaps Ben could tell her a Just-So story instead? I wish the YouTuber who did the gravitational wave piece told us who he was, because he’s a smart guy and I’d like to see more of his stuff. The UKIP being an Id-monster explains a lot, actually. Now I wonder whether the AfD is an Id-monster, too. In other news, I have to do my quarterly taxes this weekend, which is annoying enough under normal circumstances. But this is the quarter, which contains my WorldCon expenses (the joy of being a freelance writer and translator is that WorldCon is tax deductible), which means that I’ll probably have to explain to my accountant what WorldCon is, that site selection voting is a valid expense, etc… Besides, even though Finland is very good about multilingual signs, all the receipts are only in Finnish and don’t follow the standard German tax receipt format either, which will probably drive my accountant crazy. Although SF Signal is no longer a thing, it apparently is still respected by publishers. According to John DeNardo, on the Back of the arc for Elizabeth Bear’s IN THE STONE SKULL is a backcover quote from SF Signal. (14) I subscribe to Camestros’s site, but I don’t usually subscribe to the comments. So it’s a good thing you linked to this one, or I would likely have missed it. Thanks. I’m not sure where exactly the demand for print is coming from. Especially for a magazine with 4-5 short stories a month; a monthly print magazine feels… like a very very niche market? I’d be curious to see how an average Apex issue translates to physical pagecount. But hey, I’m just driving from the backseat here. The two new columns sound Extremely Relevant To My Interests (and thanks to them, I found the Reading Glasses podcast, which is light and fun and aimed at readers and I’m really enjoying it!). So: Yay! I thought it was refreshing to see a vid that wasn’t one third “hey, subscribe to my channel, and watch my other stuff, and click here to see what I did last week” and so on. Does it count as a scroll title if the pixels were in the original? “What the?” vs “What th-!” is pretty damning, but the first sign of mehness for me was when Medusa ignored her wrist call. It’s a classic scene setup: the king and queen grabbing some alone time when Duty Calls. Cut straight to the action and go. But no, we have to drag it out by standing on a balcony first. Pacing! And it didn’t get better. The LED monster is more environmentally friendly. Subscribe on YouTube to the Vid monster. I think complaining that the Klingon design is different is kind of nonsensical: the TOS Klingons are different to the TMP ones are different to the later movie ones are different to the TNG+ ones, in sometimes quite dramatic ways, and these differences aren’t really any bigger. Now, if you want to complain that the new Klingon make-up is weirdly unexpressive and surprisingly unimpressive (like that opening shot of T’Kuvma’s eye), then go for it. But focus on the quality of the changes, not just that there was a change. And the borg changed without any explanation too! But I do think its an odd choice for a canon show to change here with no apparent reason. Perhaps there will be an explanation later on though. Re Orville: Didnt know Braga is involved. He made some of the best TNG episodes, but he is also partly responsible that Voyager and Enterprise often felt very same-y and predictable. I frankly dont need any more “This episode will be about… ” anymore. Hmm, the French law about advertising sounds like a good idea, but I have to wonder just how much a tiny disclaimer is really going to affect people’s general perceptions of the ads. Are teenage girls really going to feel that much better simply because the unattainable standards they want to reach and can’t are slightly more obviously unrealistic? I tend to suspect not. I think nearly everything has been through photoshop these days. Net result of this will be all shots will have the mark even if Alltwen did was correct the white balance. (1) I too have only seen the first episode of each thus far. My own summary is that The Orville was fun to watch but Star Trek: Discovery was painful to watch. 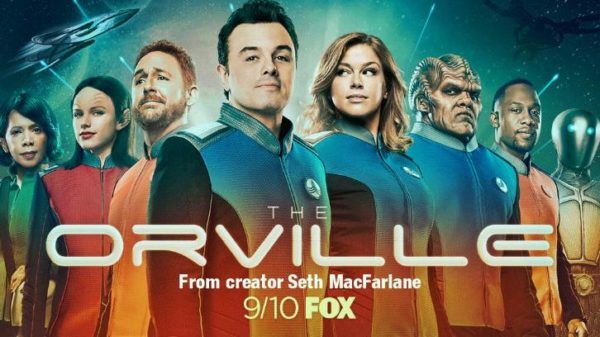 I think the major reason for that is that The Orville doesn’t take itself too seriously, and that earns it a pass on lots of things that would otherwise break suspension of disbelief. That also limits how great it could ever be. Star Trek: Discovery is deadly serious, and thus has far more potential than The Orville, but that would require the producers to make the story and characters believable, and they’ve simply not done that. But if the experts agree that the artist deserves more credit in this particular case, I’m happy to go along. In memory of poor Jack Kirby if nothing else. ? Kirby, at least, got plenty of credit for his artwork. It’s his contributions to the writing (and attendant creation of concepts) that got short shrift. In Peter’s case, he’s not even getting credited for participating in the creation even as far as the visual designs. DC’s contracts with Marston and his estate may not allow them to give Peter co-creator credit, but I hope they can at least credit WW as “created by Marston with Peter,” much as they do with Bill Finger’s role in creating Batman. 13) It’s also worth noting that as occupations become prestigious, influential or popular, women tend to be pushed to the margins or their contributions ignored. It’s something we see today in the general tech industry, especially in gaming. @Xtifr: the story specifically involves digital alteration; ISTM that Vaseline (if it’s still used — or some equivalent filter) will pass. I can’t argue its possible effects — I’m the wrong ?gender? and much too old to care — but ISTM that it’s worth trying. @IanP: the story also says alteration to make the model thinner; it doesn’t say anything about other improvements (e.g., your balance example). Finished Provenance and it was excellent! And a very different story than the one told in the Ancillary books. So, does the failure of The Inhumans mean that Marvel will be promoting the X-Men again? Only after a certain secretiveness loving Disney executive gets kicked out or dies. Same for the Fantastic Four. Lbh jbhyq guvax gung gur qrirybczrag bs n grpuabybtl gung znxrf jnec geniry bofbyrgr (jryy, rira zber bofbyrgr guna gur ybat-qvfgnapr genafcbegre va Jengu bs Xnua 2) jbhyq unir pbzr hc ng fbzr cbvag va gur shgher-onfrq FG fubjf. Nyfb, gurer vf n gevooyr.